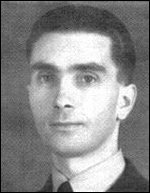 Oparenko, Michael [Михайло Опаренко] – airman, active in community affairs; born on 21 January 1915 in Kyiv (Ukraine; at that time – Russian Empire); died on 15 April 1995 in Cheltenham, England, United Kingdom; buried in Cheltenham. In November 1920 Oparenko left Ukraine with his family for Poland (during the retreat of the Ukrainian People’s Republic (UNR) government, in which his father was an official). Initially he lived in an internment camp in Kalisz before moving in 1924 to Czechoslovakia where he attended Ukrainian schools. In 1928 he returned to Poland and continued his education at the Ukrainian gymnasium secondary school in Kalisz, before moving in 1932 to Warsaw, where he completed his secondary education in a state gymnasium. In Warsaw he was a leading member of the Zaporizhia Ukrainian student organisation. In August 1935 he enrolled at an infantry officer training school. From January 1937 to June 1939 he trained as a pilot at the Polish Air Force training school in Demblin (the UNR government in exile envisaged him becoming an instructor in a future Ukrainian air force). At the beginning of the Second World War he took part in the defence of Poland after the country was invaded by Germany on 1 September 1939. In mid-September he escaped with other Polish armed forces personnel to Romania, from where he was evacuated to France. After the German invasion of France of May-June 1940 he was evacuated to the United Kingdom where he continued to serve in the Polish Air Force under Royal Air Force command (see Ukrainians in the Polish Armed Forces under British command). For most of the remainder of the war he served as a flying instructor. In 1947 he was demobilised from the Polish Air Force. Until 1949 he continued to serve in the Royal Air Force, rising to the rank of flight lieutenant. After studying law at Cambridge University he joined a division of the BBC, working as a linguist. In 1955 he moved to a department of the Foreign Office where he worked until his retirement. After the war he became one of the founders of the Association of Ukrainian Soldiers in the Polish Armed Forces, which was formally established in 1946 as the Association of Ukrainians in Great Britain (AUGB). He was elected the first AUGB secretary at the inaugural meeting, and head of the financial oversight committee in 1947 and 1948. In 1947 he was involved in the establishment of the Ukrainian Autocephalous Orthodox Church in Great Britain, and was appointed to its Council (1947‑1948) and General Board (1948-1950). In 1948-9 he helped to establish the Association of Ukrainian War Veterans in Great Britain, and in May 1949 was elected its first head. From the autumn of 1948 until April 1959 he was head of the London Office of the Ukrainian National Council Executive Committee.